Although rudimentary forms of embroidery have been with us since the dawn of recorded history, what we know as modern embroidery has only been with us since the 16th century. Into the 18th century, pattern and sampler books became popular for young women, and consisted of practice stitches and repeating designs. With the advent of the industrial revolution, an automated machine was invented in France by Josué Heilmann in 1832. 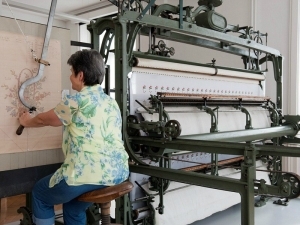 It consisted of a pantograph-style mechanism which an operator used to hand-trace a pattern that was then sewn using a double-pincher system of needles in series. With the digital revolution came computerized embroidery, and in the present, we can quickly create programs which tell the embroidery machine where to sew and with what color of thread. This process is called digitizing and is necessary to set up prior to running an embroidery job. Generic names and numbers are referred to as monograming, and since this is not a special pattern it does not require the digitizing step. How do I get my art digitized? Digitizing is a quick process if you already have camera ready art. A clean vector file (*.AI, *.SVG, *.EPS and sometimes *.PDF) is usually required, as this will provide sharp edges that will produce a clean image. It is important to note that the larger the image or more fill that the image has, the more expensive it is to both digitize and to sew, as the price for both is determined by stitch count. The charge for digitizing is a one-time fee, so when you are ready to reorder you won't have to pay a setup charge. I think I already have my image digitized. Great! That saves us a production step. Go ahead and send us the file, it is usually in a *.DST or *.EMB file, but there are many different file formats. It will not open in a normal graphics program, and if it is in an obscure format, we should be able to convert it easily into a more common one. Some people will incorrectly believe that a vector file is the embroidery file, but these are two totally different items. If this is the case, see the previous paragraph. What garments are best for embroidery? What is better suited for screenprinting? Embroidery is best suited for something a bit heavier, such as a jacket or heavier woven shirt. It also is exclusively suited to six-panel baseball caps, since embroidery is not affected by the seam like screen printing would be. It also works great on multi-layered or fluffy jackets, which may be problematic with screenprinting. On the opposite side of the spectrum, anything that is super thin will have some negative consequences, especially on dryfit or lightweight garments less than 6oz. Since the thicker nature of the embroidery compared to the thinner fabric will expand and contract at a different rate when washed, the embroidered art will curl immediately. Also, embroidered images require a backing material which is counterintuitive to why we want to use lighter fabrics to begin with. In these cases we highly recommend screenprinting to embroidery. I have my digitizing done and shirts picked out. Let's pull the trigger! Once all our ducks are in a row, we can get the job written up with all the specifics and will send you the invoice. Once this is paid (under $500 is required to be paid in full, over $500 we accept 50% deposit) we will provide you with a final mockup which must have written approval. Once we have final art approval then we can get the shirts ordered and get you on the schedule! We accept cash and local or business checks and can accept payment online directly through our invoicing system. Our normal turnaround is 7 to 10 non-holiday business days. We offer a rush service upon management approval at a sliding fee scale depending on how close the due date is. What colors can we embroider with and where? 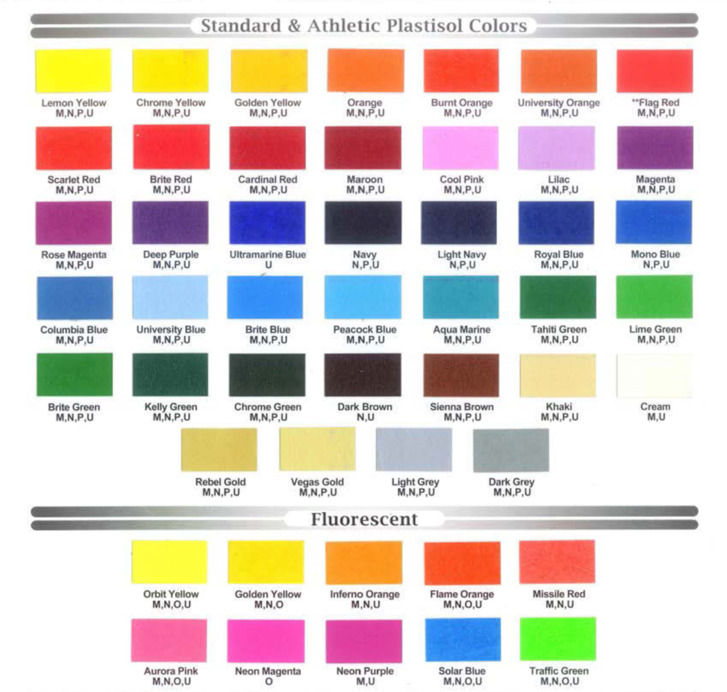 We use standard colors as provided by our thread manufacturer. Please view the color chart for an approximation of what the exact color look like. We have color cards available in-house with the exact hue on color samples. Due to differences in monitor brightness and hue, as well as differences between reflective and emissive light and the effect it has on tonal value, DO NOT use the color chart online as an absolute guide. 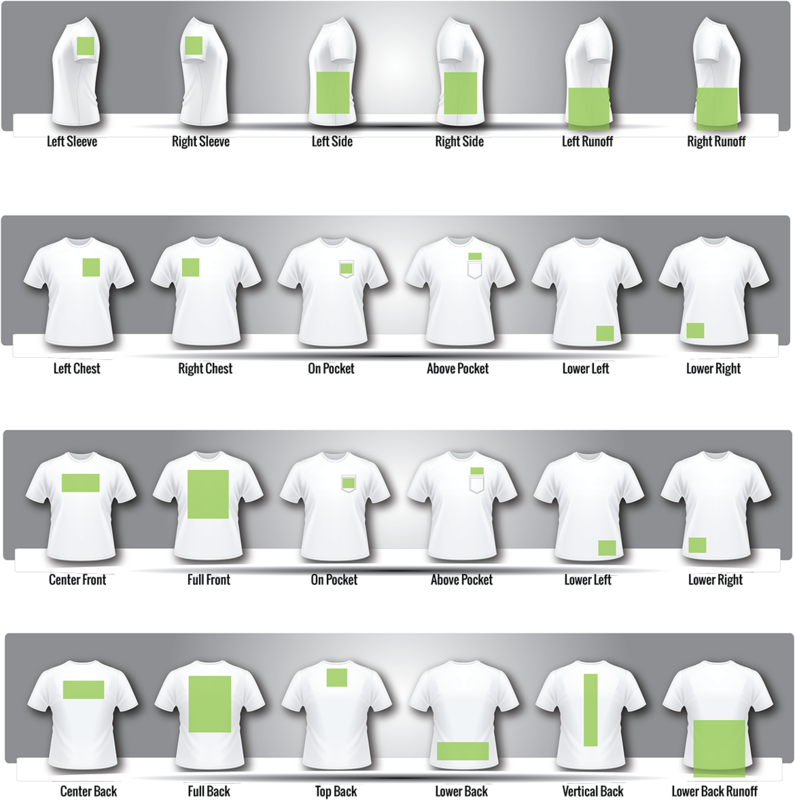 Please see the placement guide provided here to tell us where you would like the image to be placed on your garment. How do I get my stuff? Once the order is complete, you will receive either an email, text, or telephone call to let you know. If we don't reach you or hear back, we will try contacting you in multiple ways to make sure you know as soon as your order is complete. If you prefer us to ship, we can ship to your location for a $10 flat-rate per package. Shoot us an email or give us a call. We have been doing this for a long time and will be able to answer just about any question you might have.